After all the bags I just purchased, I vowed not to buy any more for a long time... until I tried on my friend's Chloe 'Small Paraty' Leather Satchel and fell in love with it. It's the perfect size for me so I couldn't resist just adding one more bag to my collection. :) It's the last one for now, I promise! 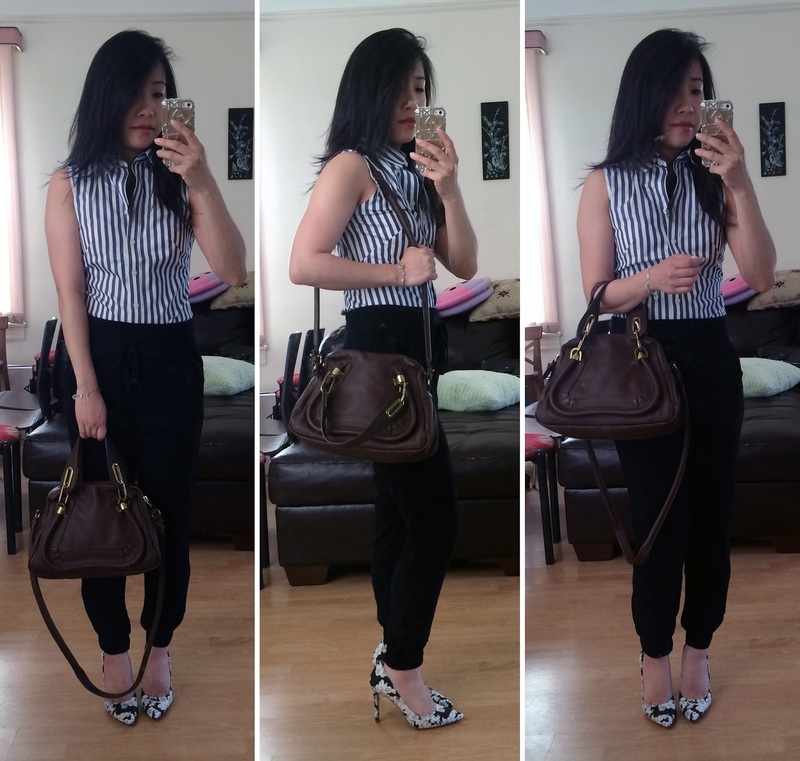 Top: Banana Republic Fitted Non-Iron Striped Sleeveless Shirt. Pants: American Eagle Outfitters (old but similar here). Shoes: Banana Republic Ninah Pump. 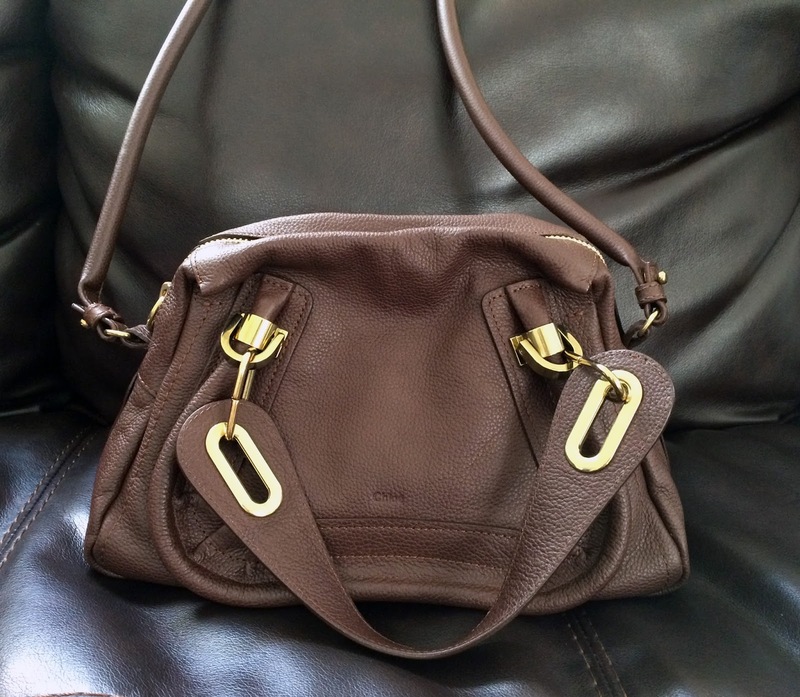 Bag: Chloe 'Small Paraty' Leather Satchel. And since I"m wearing them here, I also want to share a few recent purchases from Banana Republic, which are the Fitted Non-Iron Striped Sleeveless Shirt and Ninah Pump.Though the shirt fits very well, I decided not to keep it because it's not really my style but it's good to know this type of shirt fits me well so I can keep an eye out for future variations of the style. I do actually like the Ninah Pump a lot and they're very comfortable with a cushioned footbed but they're unfortunately a bit too big on me so are going back. Top: Banana Republic Fitted Non-Iron Striped Sleeveless Shirt. Pants: American Eagle Outfitters (old but similar here). Shoes: Banana Republic Ninah Pump. I also want to share this Plaque Stretch Skinny Belt that I've been coveting since I saw it in stores (but not in my size). It's unfortunately sold out for me in Black, size XS but there are still a few sizes left. Even though I rarely ever wear belts, it's sleek and is quite versatile so I do hope it comes back in stock.